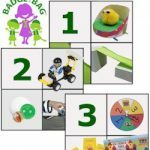 Choose three of the popular badge kits from MakingFriends®.com for one low price. Order one main bag for 12 girls and one single for each additional girl. 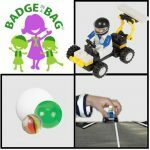 With the Beginner Car Design Badge in a Bag® from MakingFriends®.com your girls will design moon mobiles while they learn about the wheel and axle and earn the Brownie* Race Car Design Challenge badge. Your troop of 12 girls will learn about overcoming friction. 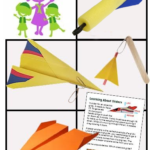 The Beginner Fling Flyer Badge in a Bag® kit from MakingFriends®.com includes five activities to make earning your Brownie* Fling Flyer Design Challenge badge out of this world! Take your troop of 12 girls on an adventure in aerodynamics. They will learn about lift, drag, weight and thrust with experiments and activities suitable for Brownie aged Girl Scouts. Take your girls on an adventure with astronauts and aliens! Beginner Leap Bot Badge in a Bag® from MakingFriends®.com will make it fun and easy for your girls to complete the requirements for the Brownie* Leap Bot Design Challenge badge. Your troop of 12 girls will learn about potential energy and the power of springs. 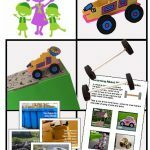 Easy snap-together car design pieces will make this a favorite activity your girls will really enjoy! 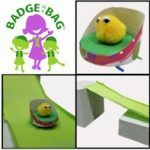 With the Novice Car Design Badge in a Bag® from MakingFriends®.com your girls will have fun designing and testing cars and learning about friction while earning the Daisy* Model Car Design Challenge badge. Your girls will love to design an amusement park themed game! 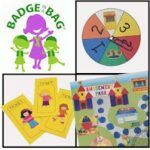 With Game Design Badge in a Bag® from MakingFriends®.com your girls will have fun designing and playing games while they earn the Daisy Game Design Challenge badge! So much fun to make and test! 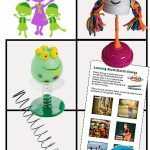 With the Roller Coaster Design Badge in a Bag® from MakingFriends®.com your girls will get to make and test roller coasters while earning the Daisy* Roller Coaster Design Challenge badge.